Grower of Highest Quality Plantations Christmas Trees. All Major Species. Welcome to our On-Line Store. Our wreaths and table arrangements are handmade daily for our customers, using only the freshest high grade greens available. We encourage you to check back with us occasionally to see the new items that have been added to our line. 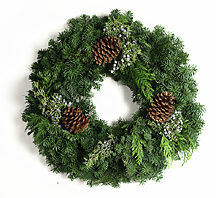 This wreath is made with fresh noble boughs, incense cedar, juniper, pinecones, and holly. The beautiful wreath hung on the front door will be a wonderful welcome to all your visitors this holiday season. 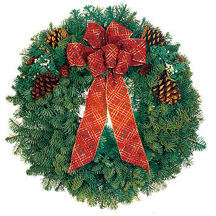 Our 25 inch wreath has been embellished with a large red bow with this beautiful wreath. Thank you for visiting Loch Lolly. It is our desire to provide quality products and great service. We hope that the information provided here will be helpful in making your decision to purchase. Please feel free to contact us if you have additional questions or comments. We value our customers feedback. All of our products are guaranteed to be fresh on delivery. If you are not satisfied with your wreaths or table arrangements when you receive them, please notify us within 48 hours of receipt and we will replace the product, or refund the purchase price. Prior to shipping, wreaths are dipped in Vita, a biodegradable floral preservative that lengthens the life of the greens and acts as a fire retardant. All products are perishable and should be kept moist by heavily misting every day to maintain freshness. All gift orders include a gift enclosure card with your own personal message. Please be sure to include your personal greeting on the order form. Orders are shipped FOB North Plains, Oregon. Orders will begin shipping Monday after Thanksgiving unless requested otherwise. All prices include shipping to any destination within the United States. Orders will be shipped via FedEx from North Plains, Oregon. Allow 5 days to receive your order. If you wish to have part of your order shipped to a different address than indicated under “Shipping Address,” please add it to the comments box. We will contact you for verification and alternate shipping address. Orders are subject to weather, labor (illness), and crop conditions beyond our control, and will be filled accordingly. Payment for products is due in advance of shipment. Visa, MasterCard, and Checks are accepted. If you do not wish to submit your payment on line, please contact us for alternate methods of order placement and payments.